As bagpipes played “Amazing Grace,” corrections officers lifted the veil off the Fallen Officers Memorial, giving corrections staff, other law enforcement, legislators, and union supporters their first glimpse of the monument that honors Michigan corrections officers killed in the line of duty. 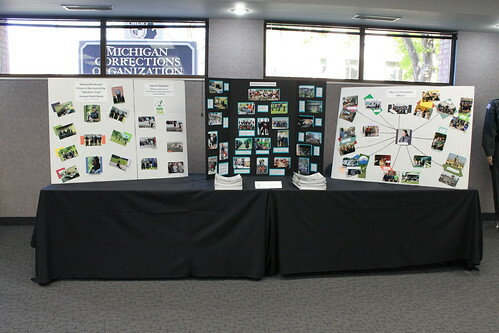 More than 300 people attended the Fallen Officers Memorial Dedication and Open House Sunday at Michigan Corrections Organization’s (MCO) headquarters in Lansing. The memorial honors the four corrections officers who have lost their lives in service to the people of Michigan. They are George Haight (date of death March 27, 1893); Earl DeMarse (Sept. 25, 1973); Josephine McCallum (March 24, 1987); and Jack Budd (Dec. 27, 1987). SEIU President Mary Kay Henry spoke at the ceremony of MCO and SEIU’s OneVoice national campaign, which seeks to elevate the voices of Corrections Officers and provide them a voice as corrections reform is debated around the nation. Guests learned more about MCO at the open house, where several exhibits showcased the dangers corrections officers face and MCO’s new work to engage members. To mark the occasion, MCO created a special commemorative coin that was given to all guests. The memorial honors the fallen, but the coin acknowledges those currently working behind the walls. “Whenever someone looks at this coin, we hope they reflect on us, the corrections officers, working at that very moment. We put our safety on the line in service to our communities every day,” said Lorraine Emery, corrections officer at the Bellamy Creek Correctional Facility. Michigan Corrections Organization/SEIU represents more than 6,500 corrections and forensic officers working at state prisons and at the Center for Forensic Psychiatry. Members, wear your uniform to the Fallen Officers Memorial dedication May 7!